The sacroiliac joint or SI joint is the joint in the bony pelvis between the sacrum and the ilium of the pelvis, which are joined by strong ligaments. In humans, the sacrum supports the spine and is supported in turn by an ilium on each side. The joint is a strong, weight bearing synovial joint with irregular elevations and depressions that produce interlocking of the two bones. 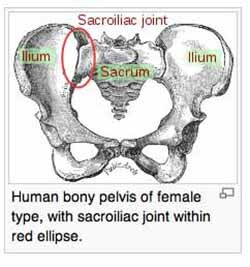 The human body has two sacroiliac joints, one on the left and one on the right, that often match each other but are highly variable from person to person.